Does he have enough to back that ballsy statement up? Those dreaded seven words have been uttered once again. This time, it's the turn of 2014 NBA MVP Kevin Durant, to do so. In a recent interview with the Washington Post, Durant said the exact same words Lebron James infamously mouthed during a post-game press conference at this year's Finals. 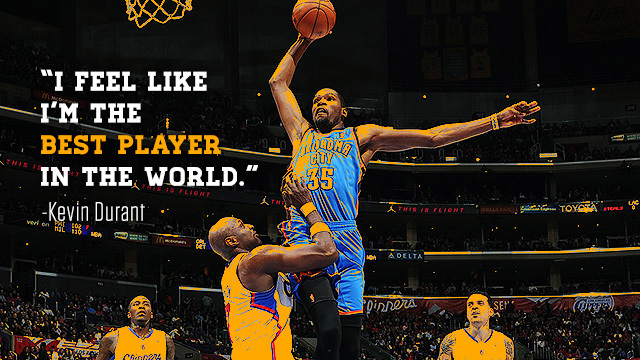 "I feel like I’m the best player in the world," KD told reporters at USA Basketball's two-day mini-camp in Las Vegas. "No disrespect to other players here, but I always got that confidence… I never had no doubts in myself." Fortunately, unlike LeBron, it seems that the Oklahoma City Thunder superstar's statement was taken a bit lightly, maybe also because of the context—he was actually being asked about his post-injury body. However, we ask you, fellow NBA analysts aficionados, if the Durantula has a solid case for his claim, especially since he's coming off an injury-riddled season which saw him suit up for a paltry 27 games.